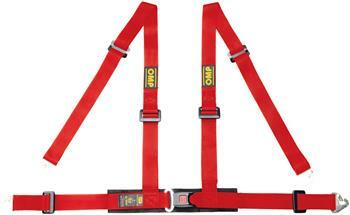 OMP America Safety Harness - Road 4M UNIVERSAL - Dezod Motorsports Inc - Home of the automotive performance enthusiast since 2002. 4 point harness, 2 shoulder and lap belts, snap hook attachment. Central push button release. Waist load spreader pad. Supplied with 7/16 eyebolts.